Home Entertainment News Um, Hold Up. Did Madonna Get A** Shots For Christmas?! Um, Hold Up. Did Madonna Get A** Shots For Christmas?! 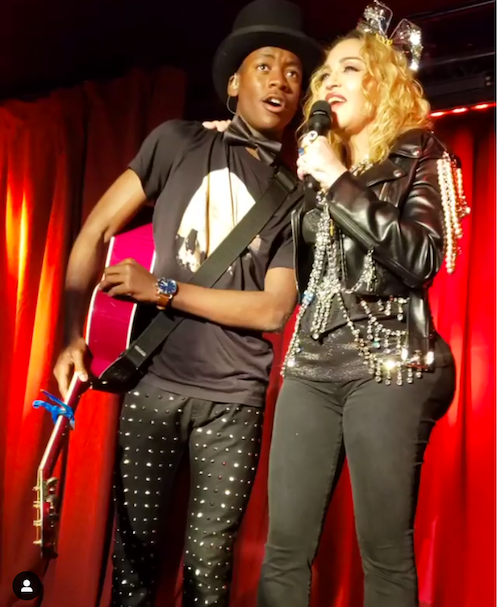 Madonna was singing her LGBT fans into the new year Monday, but most of us can’t even hear it because her newly puffed up ASSets are screaming so loud. Check it inside…. Madge is no stranger to lil nip, tuck and plump. Especially not to her face. But we don’t ever recall her booty being THIS plumped up. And no, the thigs don’t match. She performed with her son at the historic Stonewall Inn in NYC on NYE, and we’ve got some questions. Now Madge. What did you go and do? It could be one of those Booty Pop contraptions. Or she could have actually went in to the doc to get a lil filler. Hey, to each their own. Who are we to judge. If she feels it’s necessary chile, do you boo.